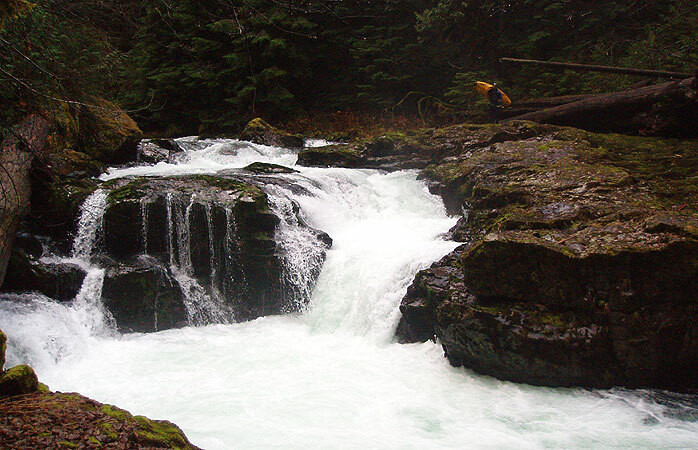 In the late 1990's Canyon Creek Washington was threatened by a hydropower developer who wanted to divert the water out of Canyon Creek into a micro-hydro project. As far as I know, this developer still has the permit, so we may be paddling Canyon Creek on borrowed time!! I really can't imagine a de-watered Canyon Creek, but it may happen if this developer gets their way. If anyone has any recent information about the status of the Canyon Creek de-watering project, let me know and I'll post it on my site..
Canyon Creek Washington is one of the most famous Creeks in the Northwest. 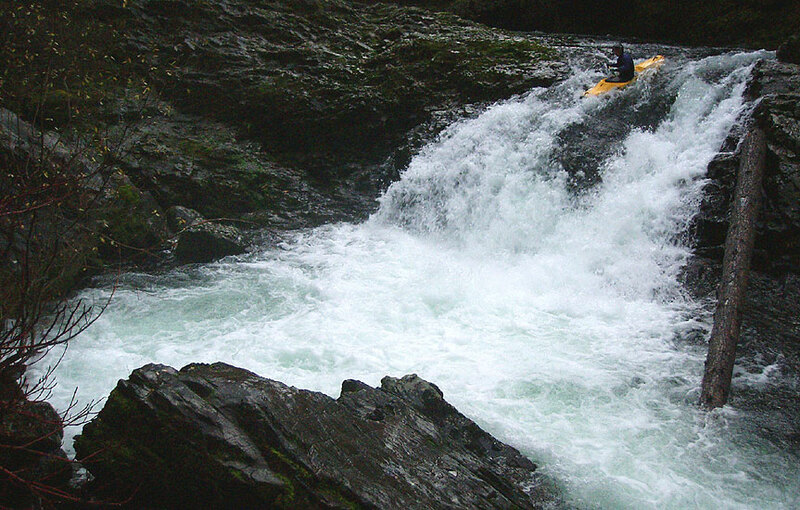 This run attracts paddlers from far and wide, lured by the prospect of big drops and falls in a narrow gorge. The lower section of Canyon Creek is fun, but I had always wondered what lay upstream. The Bennett description made the upper section sound pretty intriguing, so in November of 2004 Pete Giordano and I decided to give it a go. After poring over the topo maps for awhile, we decided to put in as high as was practical, so we could see as much of the upper section as possible. After dropping a car at the Fly Creek bridge, we wandered off into the hills in search of adventure. After poking around a bit way up high, we decided to put in 14 miles upstream from Fly Creek, where Pelvey Creek drops off the ridge into Canyon Creek. When we arrived at the bridge over Pelvey, we were intrigued to see a 15-foot falls on the upstream side, while the downstream side dropped away precipitously. We had planning on bush-whacking our way down the canyon wall to Canyon Creek, but now there was another option..
"Well lookit that." Pete said, peering down as Pelvey Creek rushed frantically under the bridge, joining Canyon Creek somewhere far below us. Well, the choice between groveling your gear down the canyon wall to the creek and paddling your gear down the canyon wall to the creek isn't really a choice, so we saddled up Pelvey and hung on for the ride.. Whoo-boy that was a fun one, I might go back up and see what's upstream of the bridge sometime.. The fastest way to get down to Upper Canyon Creek from the road is Pelvey Creek! Pete Giordano gets ready to take flight on the extremely steep and congested Pelvey Creek, a fun tributary of Upper Canyon Creek.. I think with a little less wood Pelvey might have some potential. Just above where Pelvey Creek joined Canyon Creek there was a big logjam, which we portaged on the right, walking down to the confluence of Canyon Creek from there. It is always so exciting to run a new creek; you just never know what is around the corner. Upper Canyon Creek started out beautiful from a scenery standpoint and stayed that way for a couple of miles; thick moss-laden old-growth cedar and pines towered overhead.. pretty amazing. The rapids, on the other hand, were pretty sparse in the first couple of miles. There were a few small ledges here and there, but overall the creek was more class II-III, with maybe one class IV at high water. The good news is that there is very little wood, so it goes pretty fast, though there are some nice playspots as well. It's really too bad there aren't more rapids on the section between Pelvey and Jakes Creek, because the scenery is superb. 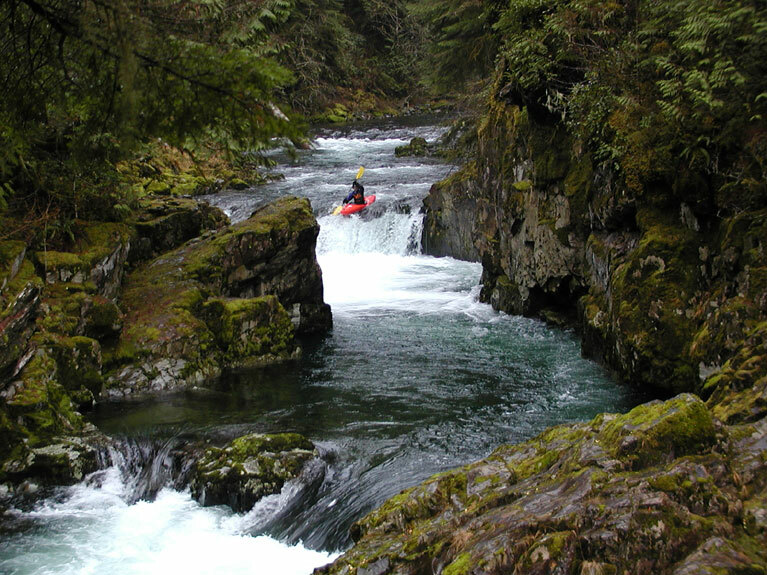 Finally after a long flat section the creek crossed a solid band of bedrock and dropped through some fun rapids ending at the first big ledge on the upper section, an auto-boof six-footer.. 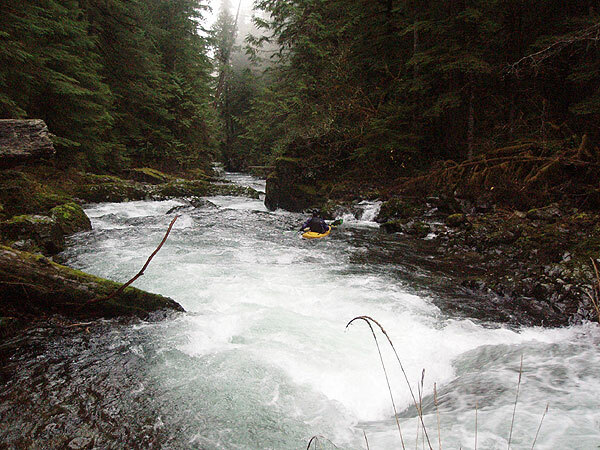 The beginning of one of the fun sections on Upper Canyon Creek. In the distance the first big ledge is just visible where the walls pinch down.. The author runs the first big ledge on Upper Canyon Creek. Here most of the water sluices to the right ( not visible in the photo ) through some jagged bedrock. The boof on the river-left where I am had less water but was a cleaner line..
Below the first big ledge we could see the Split Falls bridge access road about a hundred feet above us on the right, meaning that it might be possible to put in just above the first ledge on future runs. Soon the creek turned sharply to the right and we arrived at split falls bridge over Canyon Creek, and we got out to scout. ( I'm not sure if this falls has a name, but I'll call it Split Falls in this report, apologies in advance to the first descentionists if they named it.. corrections would be appreciated! ) Split Falls divides around a rock island. On the left side, a narrow chute plunges over a near-vertical falls into a deep, powerful hole backed up by an underwater bedrock shelf. The right side is more of a steep slide, but most of the flow crashes into a rock in the middle, requiring a careful approach and a clean, far-right line. We had scouted this falls during the shuttle already, and I had decided not to run it ( I'm pretty picky about what falls I run ever since I broke my back running Spirit back in 2001 ). Anyway, Pete decided to run the right side, so once I got set up for a photo he cruised it down the far right side of the right-side falls..
Pete drops the right side falls on the Split Falls below the first bridge. This side of the falls has a piton rock that all of the water is piling into, so you have to go far right as Pete is doing. The left side of this falls (not visible in this photo ) is more of a plunge-falls into a big hole backed up by a rock. Pete got out to scout (there was only room for one person to look at the drop), and he said there was a log blocking the flow just below the rapid. After craning his neck and frowning alot, Pete said that it looked like it might be possible to paddle over the log on the far right side. He said there was an eddy on the right in the overhanging wall, immediately below the rapid and just above the log. I figured once I got down there I would be able to find a way around the log once I got in the eddy, so I went first and ran the drop clean and then scrambled into a small eddy under the overhanging right wall. Once I saw the log I had a couple of choice curses, because I was pretty well stuck and that log looked plain mean. The water was rushing into it, there were broken, jagged branches sticking out every which way, and it was just far enough out of the water to make boating over it a tricky proposition. Well, I had limited options at this point, so I got as high as I could in the eddy and charged down over the log, making it over pretty easily. Pete was back in his boat at this point and soon ran the same line with similar results. Just downstream of here the gorge walls peeled back a bit but there were several very fun rapids before the creek took a sharp turn to the right and dropped over an ominous, smoking horizon line. "This is one of the big ones!" Pete yelled from an eddy at the lip of the drop, so we got out to scout. This had to be the rapid known as 'Marble Stairs', a drop that 'has been run' according to the guidebook. Pete and I studied this one for a minute or so, then decided to skip it because of the bottom hole, which was very stout. It is big and sticky by itself, but the water feeding into it from the opposite side of the creek helps back up the hydraulic. If it was just this drop alone I think we both would have run it, but the rapid in it's entirety was just too burly and there was a degree of uncertainty that you would reach the bottom drop in control. Portaging the biggest single drop on Upper Canyon Creek, known as 'Marble Stairs'. This drop reminded me of 'Crack in the Earth' on the Top Tye. The bottom hole is backed up by the current coming from the other side.. very burly. Just downstream of Marble Stairs we had to portage over and through a couple of huge old-growth logs wedged between the walls. We managed to do this on the right side with only minor difficulties, but I think this portage would get kind of dangerous with high water (either that or you would end up climbing up quite high to get around the logs). Downstream were more fun rapids, but then the walls opened up and creek flattened considerably. 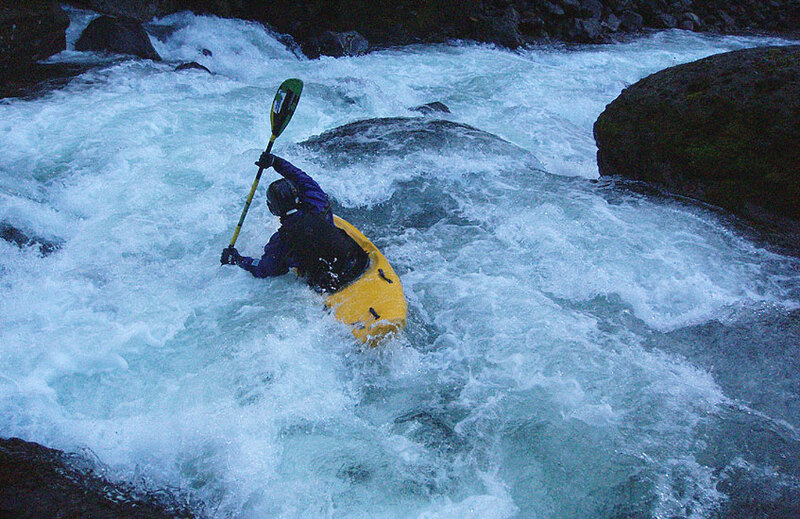 There were some fun sections of whitewater, but the majority of the water was flat, class two kind of stuff. At this point we were running out of light ( short Fall days are the bane of Northwest paddlers! ) plus it was getting quite cold. 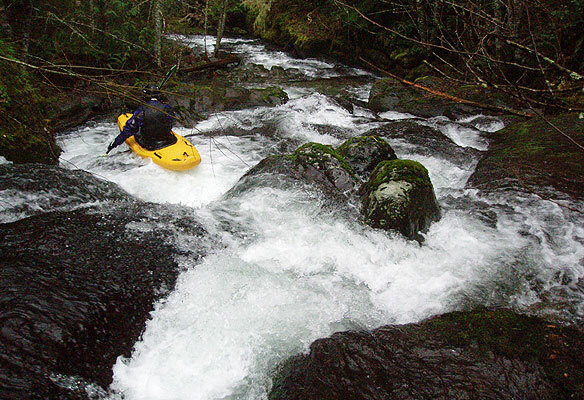 The creek continued to deliver rapids in fits and starts, with fun rapids and excellent playspots sprinkled between long, flat, tedious sections. The last big rapid is a towering boulder garden known as 'Final Exam'. This drop was really fun, and we scouted it briefly on the right side because it formed a major horizon line. Pete went first and made it look easy, I followed after shooting some photos..
Pete Giordano makes Final Exam look easy as the sun goes down on Upper Canyon Creek.. This was my favorite rapid on Upper Canyon Creek. I'm still trying to figure out how I feel about this section of Canyon Creek. I think it might be worth doing once every year or two. It definitely has some fun rapids, but there are some long flat sections as well. I think if you could find a way to put in above the first big ledge, which is about a half mile above split falls bridge, then the run might be better because you would shave off a couple of miles of flat stuff up above. On the other hand, those first couple of miles are by far the most scenic, so there is a trade-off there. The most important thing to mention is that there isn't a lot of bad wood on this run. Depending on the flow, expect to have to deal with two or three permanent-looking logs on this run. Follow the directions to Canyon Creek in the Bennett Guide. From there, find Pelvey Creek on the map, and then drive up to the bridge over Pelvey. Paddle Pelvey about 1/10th of a mile down to Canyon Creek. The best gauge for this run is the EF Lewis at Heisson. You want at least 1500 cfs in the East Fork for this section. I don't know what the upper limit would be, but I think you could do this section at pretty high water, though the gorge below split falls bridge might get kind of hectic.